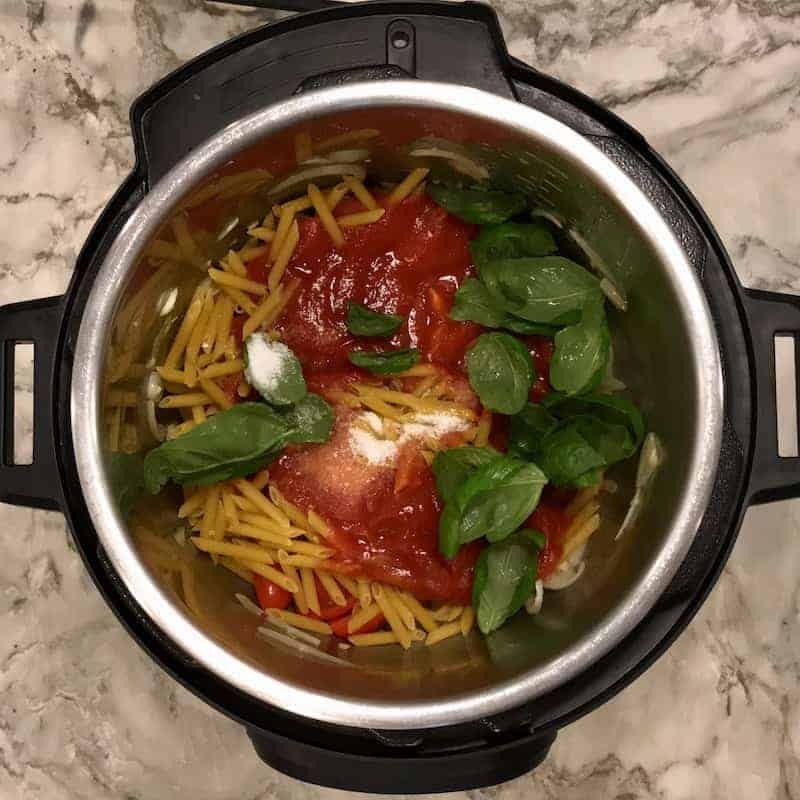 Easy one pot pasta caprese with tomatoes, basil, fresh mozzarella and a drizzle of balsamic vinegar cooked in the Instant Pot. 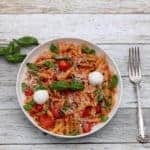 Do you love pasta? 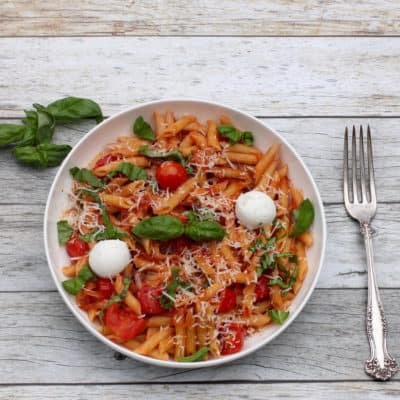 Here is a classic and flavorful Pasta Caprese recipe not to miss. 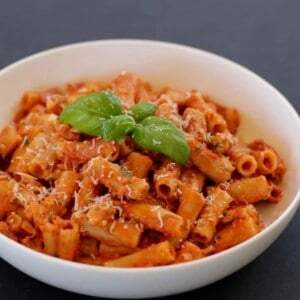 It is our favorite pasta with few wholesome ingredients. 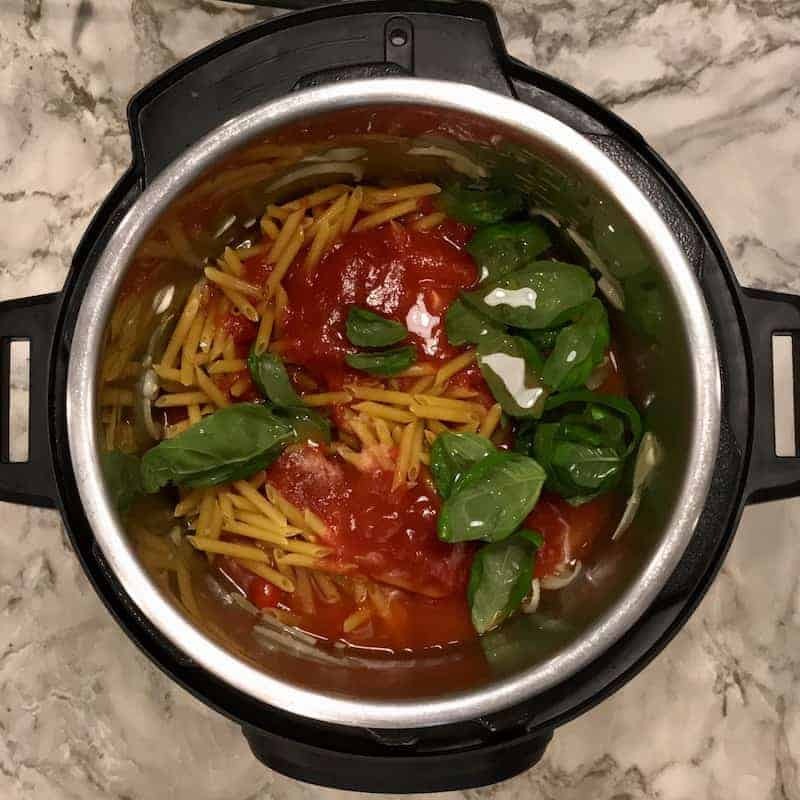 Pro tips for perfect Instant Pot Pasta Caprese. Start with mise en place. Make sure there bottom of the pot is not browned from sauteeing the onions. 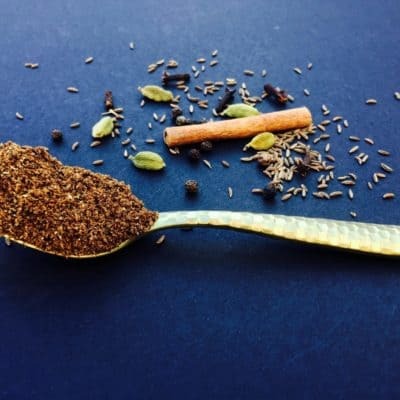 If the bottom of the pot does get browned, simply add 1 to 2 tablespoons of water, press cancel and deglaze the pot well before adding remaining ingredients. 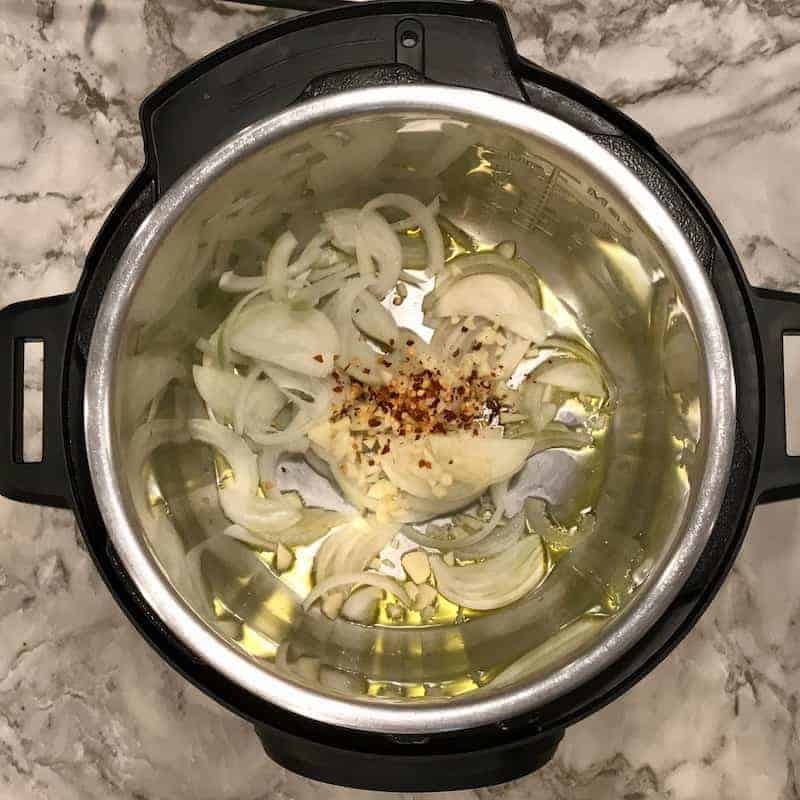 Set the Instant Pot to Sauté mode and heat oil. Add onion, garlic and crushed red pepper. Sauté for a minute. Add 1 cup of water and Gently push all the pasta under liquids. Close the Instant Pot and turn the steam release handle to sealing. Adjust the cook time to Pressure Cook/Manual(High) for 4 minutes. 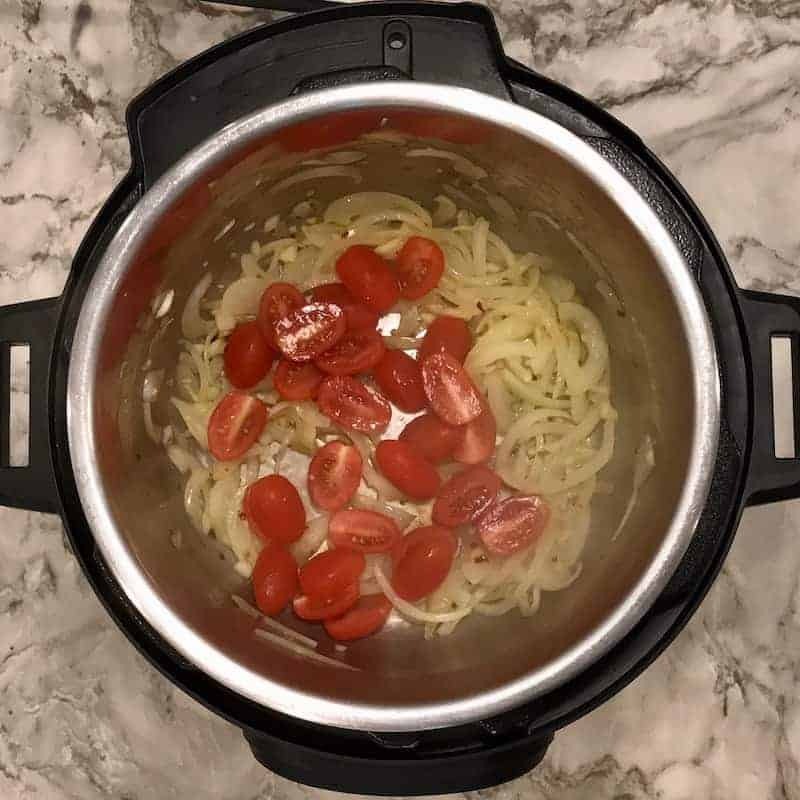 Quick Release and open the Instant Pot. Add fresh mozzarella cheese and balsamic vinegar. 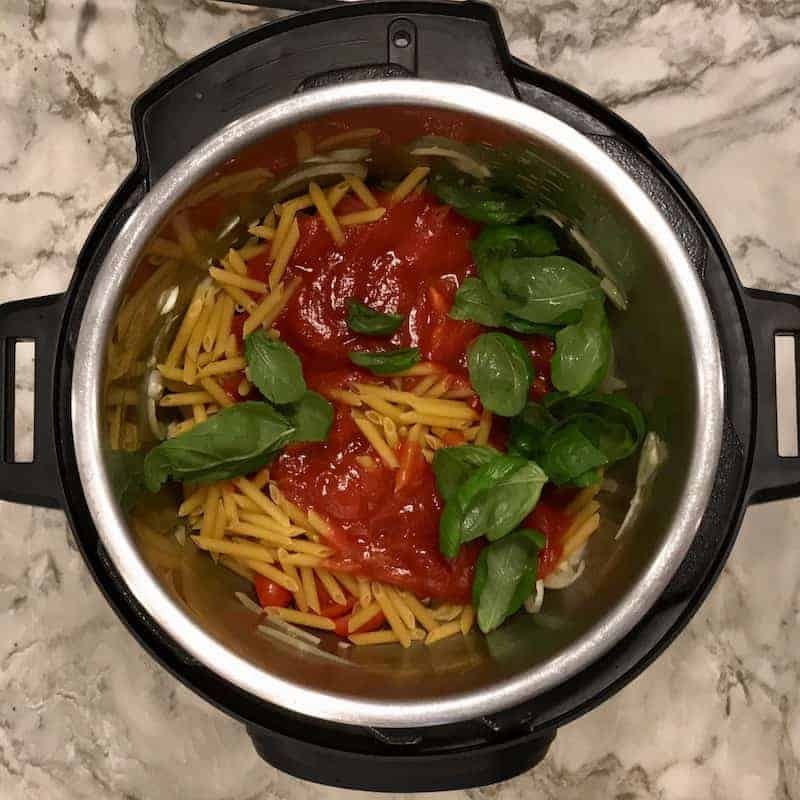 Easy one pot pasta caprese with tomatoes, basil, fresh mozzarella and a drizzle of balsamic vinegar prepared in Instant Pot. Add tomatoes, pasta, pasta sauce, half of the basil leaves, salt and 1 cup of water. Gently push all the pasta under liquids. 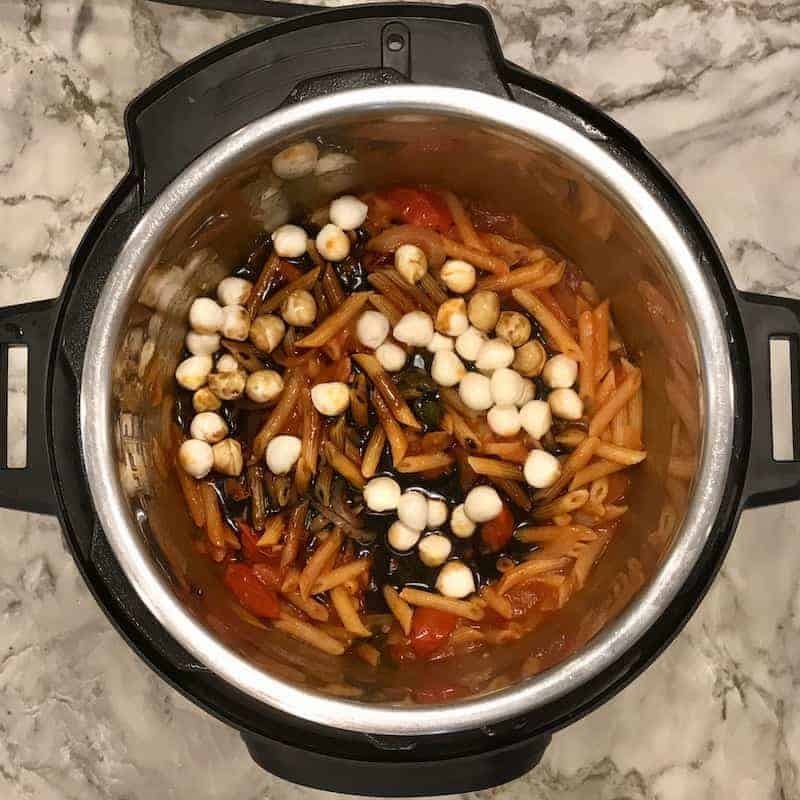 Close the Instant Pot and turn the steam release handle to sealing. Adjust the cook time to Pressure Cook/Manual(High) for 4 minutes. Quick Release. Stir genlty. Add fresh mozzarella cheese and balsamic vinegar. Serve hot garnished with more chopped basil and shredded parmesan. 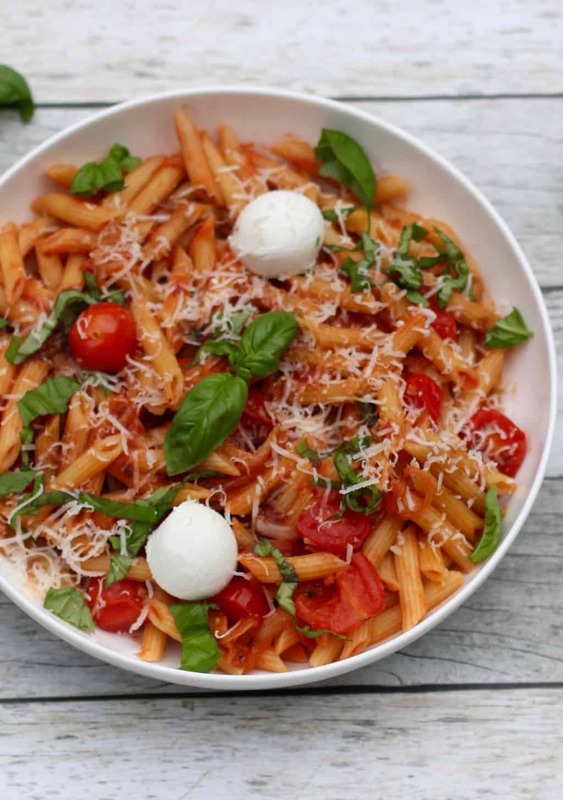 There’s nothing better than a quick pasta meal. This looks so comforting and delicious! Thank you Antonia! I love fresh basil and fresh mozzarella in this dish and the drizzle of balsamic vinegar .. just finishes up this dish so beautifully! This looks great! 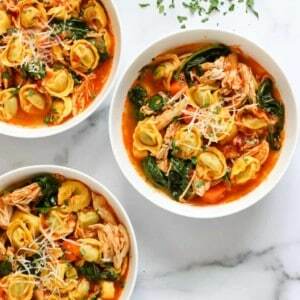 I’m trying to figure out the ratio of pasta to liquid since I’m using a different shaped pasta and am looking to go by weight rather than volume. Do you happen to know how much pasta, by weight, you used? About 1/2 box or 8 oz. 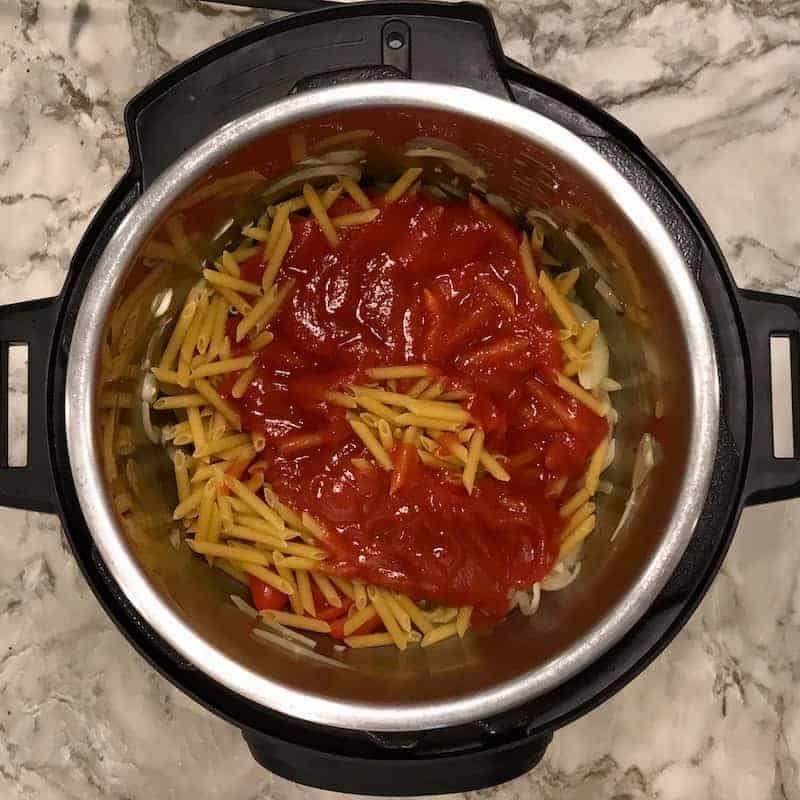 You want just enough water so that all the pasta in barely submerged under water/liquid. This looks really good! If I make a double recipe, would you increase the time? Linda, you do not need to double the time. It will work with same time. Would love to know how you like it! Thank you. It was very good! My husband said it had a restaurant quality taste. Thanks! Thank you Linda! You made my day. So glad you guys enjoyed it! ❤? Great recipe for a quick lunch dish. I tweaked the ingredients a bit by using shallots in addition to the onions and garlic. Also used whole grain pasta. Reduced the balsamic vinegar quantity- 1/4 cup is a bit much. A drizzle (few teaspoons) is perfectly fine. And pecorino Romano grated also goes well. A hearty flavorful dish all in all. Yum! Your version sounds delish. I agree, balsamic vinegar can be drizzled to taste. Thanks for the fantastic recipe! The mozzarella balls are pretty but hard to eat, so I think next time I’ll try adding shredded fresh mozzarella instead. Hi Pam, So glad you enjoyed this pasta recipe! 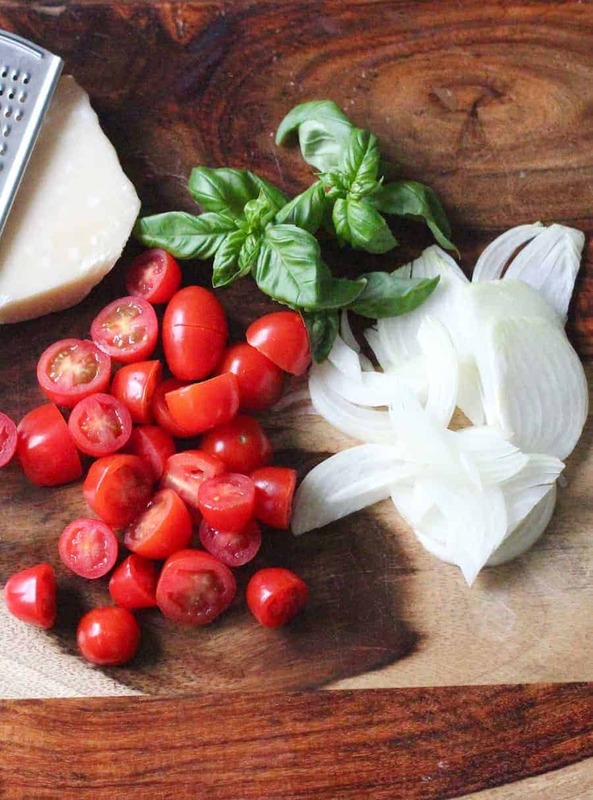 You can also chop up mozzarella balls into small pieces or shred it! How do you film your videos? do you have your camera hooked on something? I need to figure out how to make some videos to share with my sisters on things I am making. Any help would be greatly appreciated! 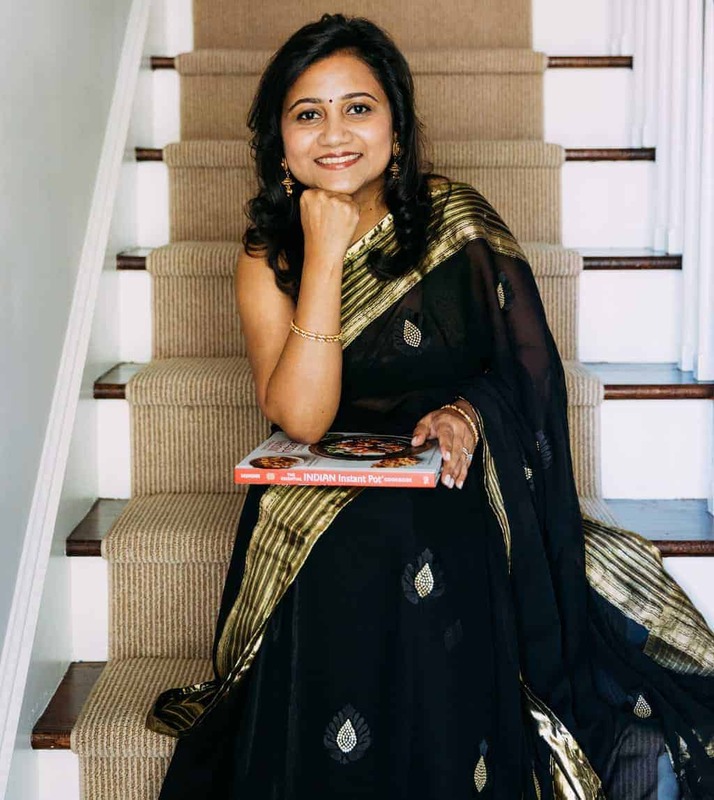 Hi Roshni, I have the camera on tripod or sometimes my boys will help me with the video as I cook. Thanks!! Also have a question for the amount of water for pasta. 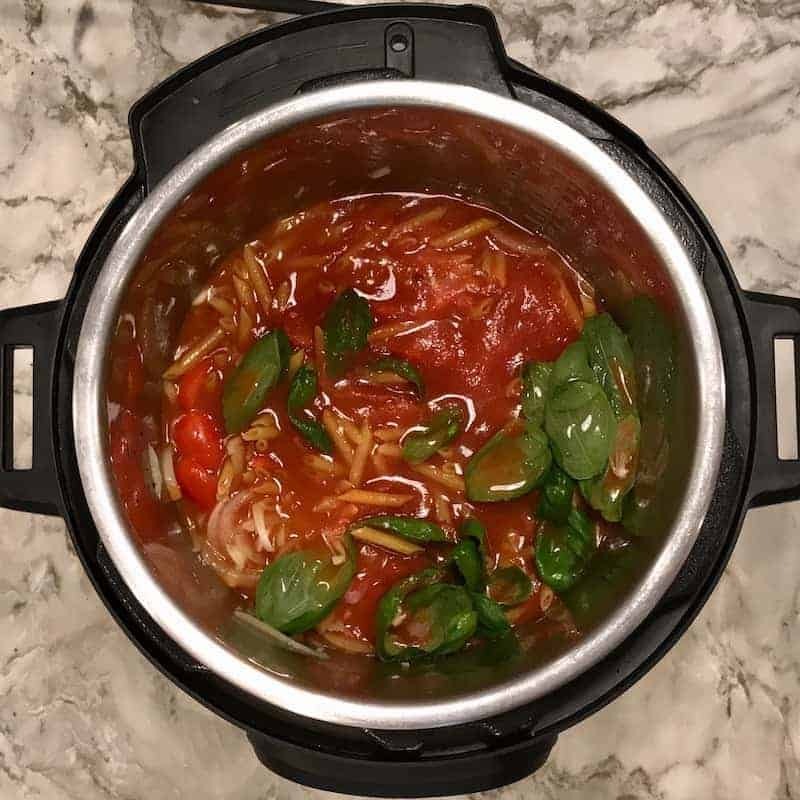 How do you determine how much water to add to pasta as it doesn’t look like a lot? I figured out your equation for cooking times but need help with water for pasta!!! Hi Roshni! It is tricky with the water. 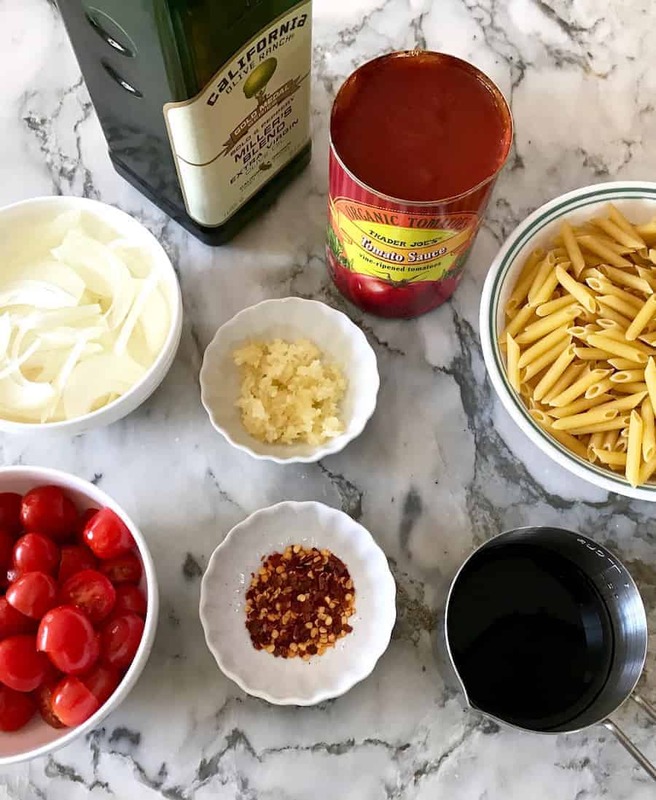 As different pasta recipes have different liquids from the sauce, tomatoes, etc. After adding all the sauces, tomatoes, I add enough water so that most of the pasta(90%) is under water. I use a spatula to push the pasta under the liquids. Hope this helps. 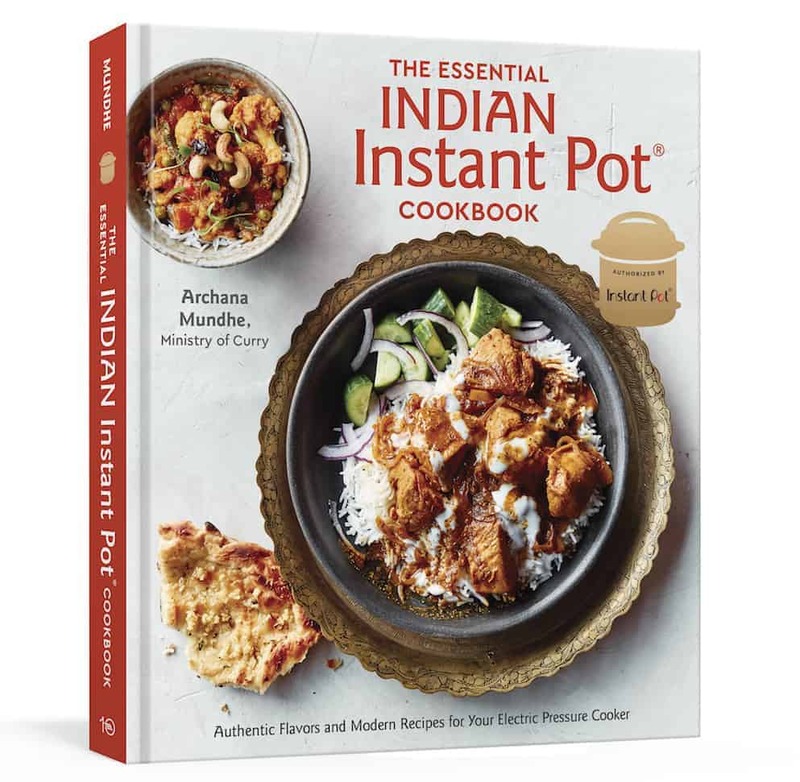 This may be not only the best instant pot meal I ever made, but maybe the best meal ever.,.amazing and super quick and easy! Hi Jo! Thank you so much! Your lovely comment made my day! 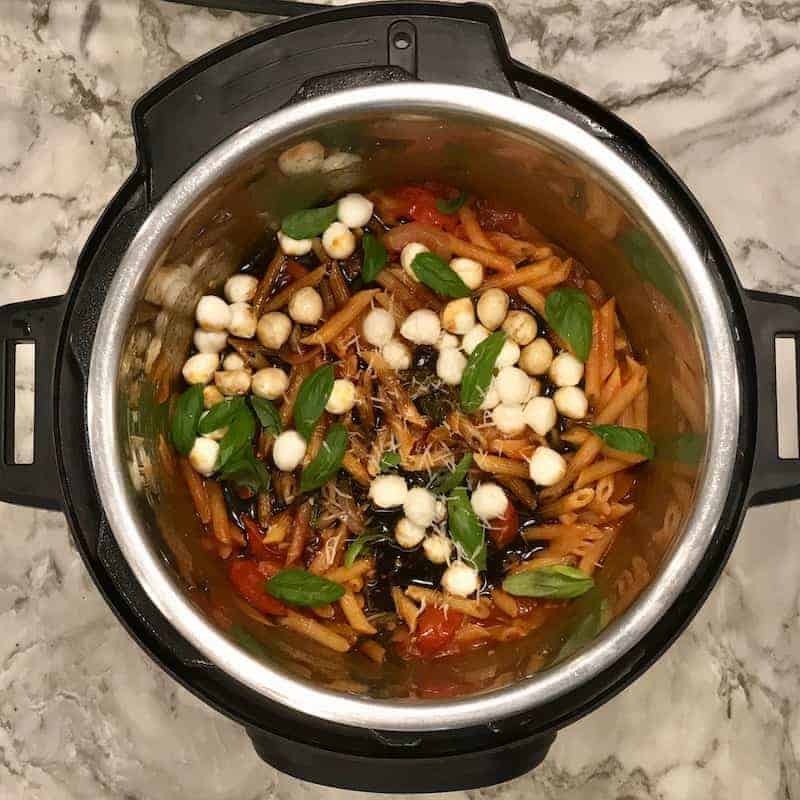 I love the way pasta cooks in the Instant Pot. So flavorful and a truly one pot dish. We have this pasta on repeat in the summers. The recipe came out awesome but I had to do 8 mins instead of 4 and put more water. Pasta was kind of stuck and little burnt at the bottom. Can you tell me what could be wrong. Hi! Need to know exactly which pasta you used and what was the cook time on the box. If the pasta is bigger than the cook time usually is also longer. You want to look at the cook time on the pasta and use half of that as the pressure cooking time. Also make sure all the pasta is under liquids so it will cook properly in the set time. Hope you will try it again! I tried to re-calculate serving for 9 people. It shows 6-1.5 cups penne pasta. Does that mean six and a half cups or 6 X 1.5 cups? This is my all time favorite recipe by the way. Thanks a ton. Is there a version with chicken for this ? Hi Roma, I have not tried capers with chicken. 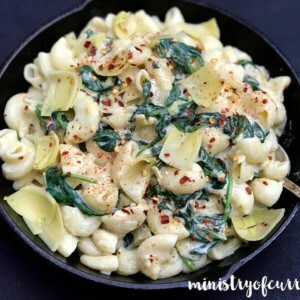 But you can add sauté either ground chicken or boneless chicken cut into bite sized pieces for 2 to 3 minutes along with the onions. Then follow the remaining recipe. I tried this today and it was so delicious The kids loved it! This was amazing! Such a basic dish but the flavors really came through. I used Rao’s pasta sauce instead of plain tomato. Will definitely be making it again!